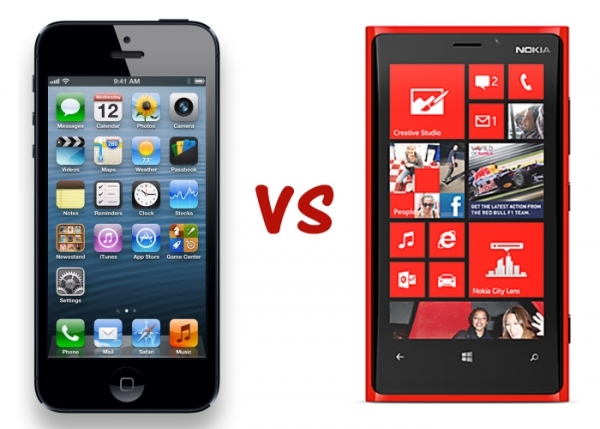 iPhone 5 vs. Nokia Lumia 920 Comparison :Which is Better Pick & Why? With the launch of iPhone 5, the battle between the top Smartphones start now. Here we will take up the biggest rivalry between Apple iPhone 5 and Nokia Lumia 920 and see which one is the clear winner out of the two. We will compare both the handsets on different features and grounds. We earlier Covered iPhone 5 vs Samsung Galaxy S III Comparison as well in our previous post. Lumia 920 follows similar design like Lumia 800 and 900. But it is very angular, with bold rectangle shape and sharp corners. The handset even has softened edges for easy handling. With polycarbonate unibody, the Lumia 920 feels sturdy and looks great in hand. With the conventional white and black colors, the brand even provides variety of bright color options that contrast with black display surround and look great even with the Live Titles of the Windows interface. On the other hand, iPhone 5 is not that catchy for the eyes. Yes, it is different from the predecessors and thanks courtesy the aluminum unibody that is stretched out, with repositioned ports and resized, but if we see, it just looks like the similar old style of the iPhones of the past. You will surely love it if you are a diehard Apple fan. But the truth is that the brand hasn’t worked much on the design and style as such. It is okay and not that striking like Lumia 920.
iPhone 5 uses the latest A6 processor that is just amazing. On the other side, Lumia 920 utilizes the Qualcomm Series 4 Snapdragon MSM8960 processor that is based on Cortex A9 structure and semiconductor technology. With Windows 8, it is a well optimized one. iPhone 5 has the storage options of 16, 32 and 64 GB while Lumia 920 has the onboard storage of 32GB. None of the two has Micro SD card capability. iPhone 5’s display screen has now expanded from past models and so it comes at 4 inches. Though it is not a very huge leap from the 3.5 inches screens, but it is sufficient to make difference when it comes to usability, overall look and visuals that you will enjoy on the device. With IPS LCD Retina Display, the resolution of iPhone 5 display is 1136 x 640 pixels. Talking about Lumia 920’s display screen, it has the 4.5 inches one. With Corning Gorilla Glass, it is the enhanced version of ClearBlack technology by Nokia that helps to improve the blacks, contrasts and dark colors. Also, Nokia’s latest PureMotion HD+ is great for better images and fast refresh rate. The Nokia Lumia 920 has resolution of 1280 x 768 pixels. While the iPhone 5 has iOS 6, Lumia 920 is featured with Windows Phone 8. In fact, Lumia 920 is the first handset to have Windows Phone 8, successor to the very popular Windows Phone 7. The software is more flexible than the predecessors and gives tough rivalry to other Software available in other high end phones. Then, the iOS 6 in iPhone 5 has improved features like improved Maps, extra icons and better Siri. Lumia 920 wins in this category as the Windows Phone 8 is surely the revolutionary update. iPhone 5 has the 8 MP camera with the Panorama mode. With Sapphire lens as well, you can have amazing pictures. The front camera is from Facetime HHD that can be streamed over the cellular data as well. As far as camera in the Lumia 920 is concerned, it sports Pureview label from Nokia. It has the 8 MP camera as well but with Carl Zeiss optics as well as large aperture. Though there is a tough competition between the two, it seems that Nokia Lumia 920 wins at most places than iPhone 5. 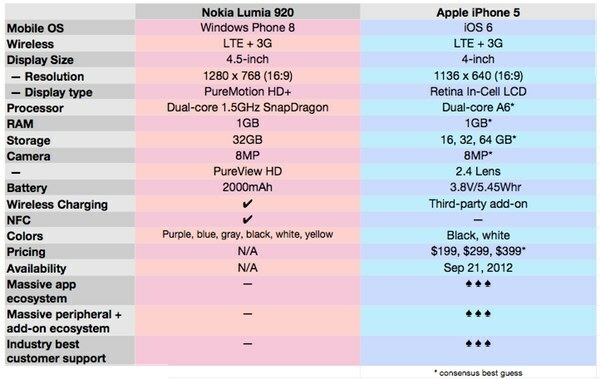 So, we can say that Lumia 920 is a better pick if you not a diehard Apple or iPhone fan.